OLYMPIC GOLD MEDAL WINNER OF THE SUPERPIPE!! 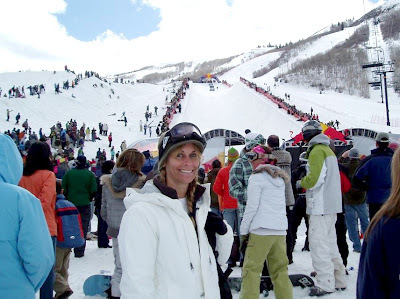 As you may or may not know, I love to snowboard, and am a huge fan of the Superpipe. 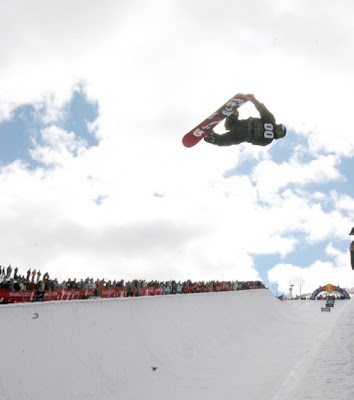 And anyone that knows the Superpipe, knows Shaun White. 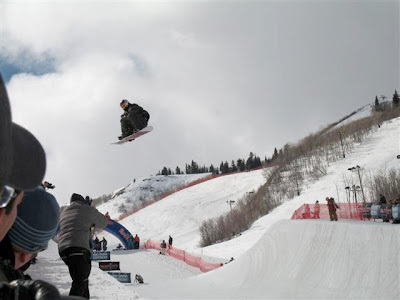 We happened to be on vacation in Utah, snowboarding, during the Olympics, last week. So watching it there, in the snowy 5 degree weather was even more fun! I was so stoked to see Shaun obliterate the competition -- yet again!! 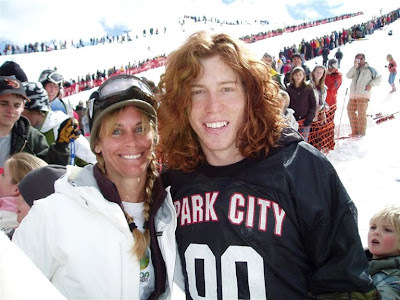 While on a snowboarding trip a few years ago, I actually was lucky enough to get to meet Shaun White at the World Superpipe Championships in Park City. He was walking past the stand getting ready to head back up the pipe for his final run. I just happened to yell out "Shaun... we came all the way from Hawaii to meet you!!!" "HAWAII" must have been the magic word, because he stopped and came over to me and said "I went to Hawaii once!" We talked for a while, and Dean snapped a quick photo of us, while everyone around was giving me the "Why is SHE so special" look. I actually felt a little embarrassed, but I didn't care. 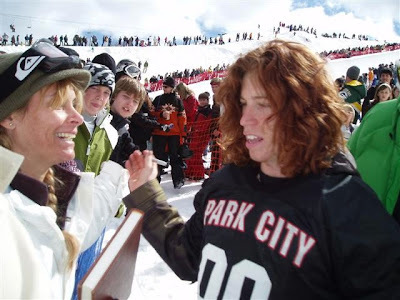 I was talking to Shaun White! My Snowboard Idol. Dean even gave me my snowboarding nickname, "SHAUNA White", years ago!! He is amazing, and TOTALLY MIND~BLOWING to watch in the pipe. I can't wait to see what awesome tricks he will think up next. He inspires me to get out there and try the halfpipe and terrain parks. But hey.... life is short. Live it up!!! CONGRATULATIONS ON YOUR SECOND GOLD METAL OLYMPIC WIN, SHAUN!! Check back next month for my "Two Year Anniversary" story of the event that got me back into painting. HINT: It has to do with a ton of snow, a tree, and a couple of screws! ANOTHER BRIGHT IDEA's GIVEAWAYS START TOMORROW! "I'd Rather Be In Hawaii" Week Blog. 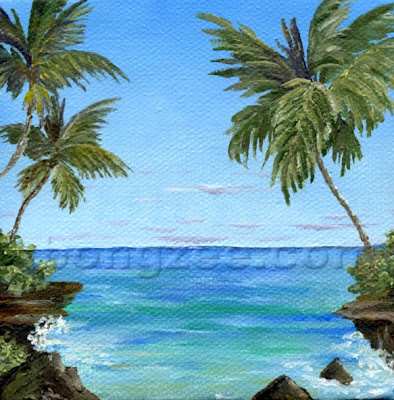 Just go to ANOTHER BRIGHT IDEA to find out how to enter the drawings for FREE Tropical Art from the four Hawaiian Artists that Felicia interviewed. First drawing will be tomorrow, followed by more drawings throughout the entire week. A new artist's work will be given away each day! Other wonderful prizes include "I'd Rather Be In Hawaii" bookmarks and magnets. 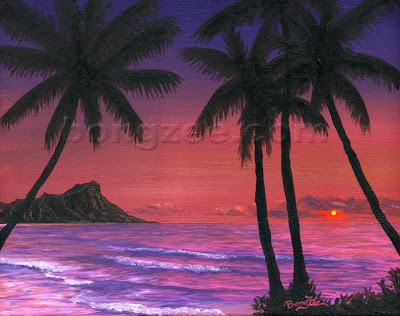 ENTER TO WIN GREAT HAWAIIAN ART !! Ever wish you could visit Hawaii but just haven't gotten around to it yet? 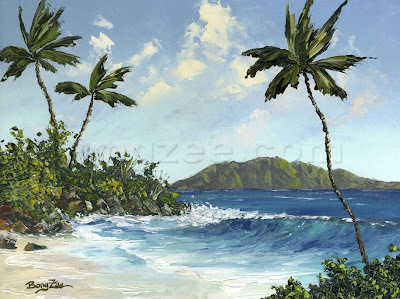 Well "Another Bright Idea" has brought the Hawaiian Islands to you through her wonderful "I'd Rather Be In Hawaii" Week blog. Be sure not to miss it!! and leave a comment at the end of each artists interview. She will be picking winners all next week, and there are many ways to enter several times, increasing your chances of winning! Felicia has also made up some wonderful "I'd Rather Be In Hawaii" bookmarks and magnets that she will also be giving away. Please be sure to read the rules for entering. Cross your fingers that you will win a little piece of Hawaii!!! GOOD LUCK!! Felicia has featured me in her HAWAII WEEK blog. Click here for my interview. 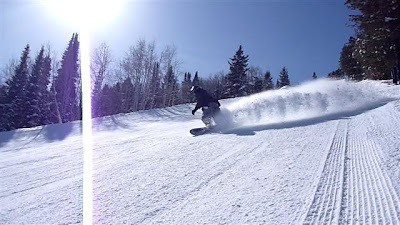 For Dean's birthday, we were lucky enough to be able to spend the day on the slopes of Brighton, Utah. One of our most favorite "Un-Hawaiian" places. Having a great day at Brighton! Dean shreading down the slope!! We will be heading back home soon, but one thing is certain. We never dread the end of a fabulous vacation because we know we are returning to our beautiful (and warm) Hawaiian Islands!! That is almost as exciting as the vacation itself!!! 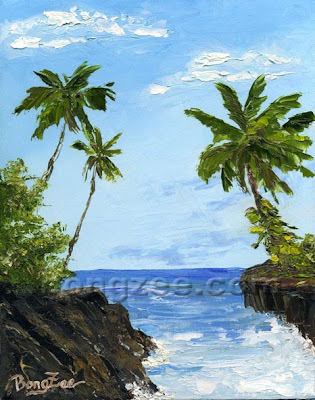 "I'D RATHER BE IN HAWAII"
She has created a wonderful "I'd rather be in Hawaii" week, featuring Etsy artists from "the land of Aloha" and some fantastic giveaways! Read her amusing (and somewhat disappointing) story of how she has tried and tried to get to Hawaii. We sure hope Felicia will get another chance to make it out here some day! On the beautiful island of Maui, Hawaii, lies a somewhat secluded beach up on the north shore. It is known as “Slaughterhouse Beach” , a horrible name for a place so beautiful. It received it’s “nickname” because of the Honolua Slaughterhouse that was located on the seacliffs above the beach. Don’t be discouraged! It was torn down in the 1960’s but somehow the name stuck. 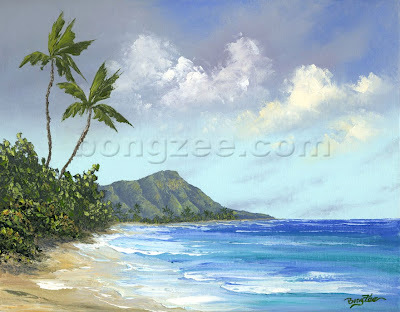 The beaches original Hawaiian name is “Mokuleia Beach”, which translated, means “place of abundance”. This is a much more fitting name for such a beautiful place. It’s gorgeous scenery attracts visitors who are willing to take the drive up the coast. It is a secluded and uncrowded pocket of white sand backed by rugged sea cliffs, with a perfect view of the Islands of Lanai and Molokai. In the winter, the surf can be treacherous, but in the summer, the waves gently roll into shore, making it the perfect getaway for swimming, snorkeling, and body surfing. A hidden Paradise on Maui’s North Shore.